That sounds delicious (especially if you add the salty feta, like you suggest)! I’m all about the salt. No way could I live in the South, but like you, I like the idea of living there. Kitch, I may just buy some flat bread and test my pizza theory this weekend. Yummy! I think down in Maryland you may have the best of both worlds, practically on the Mason/Dixon line, isn’t it? Not to mention you have those crab cakes. What’s not to like? Jennifer, sometimes Maryland feels like no man’s land. Folks up north think we’re down south and folks in the south think we’re yankees. It’s actually a very confusing place to live. Lan, I wish somehow I could buy a jar of southern hospitality and carry it with me for life’s less than gracious moments. 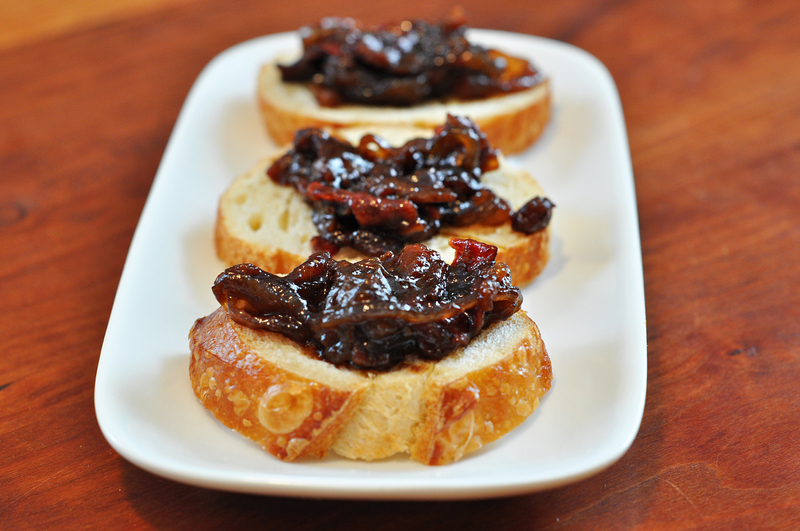 PS – I can’t argue with the merits of bacon jam. This looks delicious! It does sound perfect for pizza with feta, too. Yum! Tracy, as much as I “protest” about gaining weight from just looking at your posts, I am my own worst enemy. How else can I explain going from simple condiment to full on pizza making? I drool every time I see that photo on flickr. Your tomato jam sounds wonderful. Anna, is there an Australian equivalent to “southern living”? The tomato jam truly is wonderful. I highly recommend you give it a try. Oh my gosh, the heat is the South is terrible. I will never forget a trip to New Orleans ten years ago; it was June and I was constantly covered in sweat. The tomato jam looks quite tasty and perfect for panini sandwiches with cheese and arugula – yum! Jen, that heat and humidity is a major stumbling block to me fully embracing southern living. I don’t do so well in hot, sticky situations. Yes, this jam would love you to put it on a panini. Please do so as soon as possible. I know but it’s humid in Savannah. And I mean stupid humid. Wendi – It was such a treat to spend time with you on Saturday! Thankfully, we were lucky enough to taste some of this fantastic jam – delicious! We will definitely be making this at home, plus the bacon addition – genius! Joanne, it was absolutely my pleasure. Can I tell you that I snacked on your left over tarts all day Sunday? They were fantastic. Can’t wait till the next time we’re all together. That was a crazy fun evening. And yes, I highly recommend you make a batch of tomato jam. Fresh from the frying pan on baguette slices? Heavenly. Oh, this looks like it would be SO GOOD on focaccia. I don’t know why I’m torturing myself by reading all of these food blogs this week and looking at dishes that I won’t be able to make until the following weekend due to being out of town…I’m calling it research. Yes, research. Elizabeth, I believe in thorough “research”. Focaccia with tomato jam? Absolutely. Maybe garnish with some finely chopped rosemary. Hope you are having a wonderful time wherever your trip has taken you. Are you bringing back any good food souvenirs? My mom makes a lovely recipe with something similar – basically, just make the jam as stated above, but put a layer of cream cheese on the baguette first, then the tomato jam, then a few pieces of fresh basil on the top. Absolutely to die for. Sarah, I think your mom is a genius. Because a thin layer of cream cheese under the jam would be spectacular. Can’t wait to give that combination a try. Hey Wendi, thanks so much for including this jam in our Get Grillin’ event – it looks awesome!